Nearly everyone can identify the Big Dipper, and possibly Orion, in the night sky. But if asked to point to a constellation such as Cygnus or Cassiopeia, most of us would probably just shrug. Imaginova’s Starry Night Enthusiast 5.0 places the sky at your fingertips, making learning the constellations fun and easy. SkyGuide, the most notable new feature, uses a series of simple text and illustration lessons to teach you how to measure angular distances along the dome of the sky with your hands and fingers, and how to use the Big Dipper’s stars as pointers to other stars and constellations. To begin using the program, you select a viewing location from a list of cities, towns, and other landmarks. 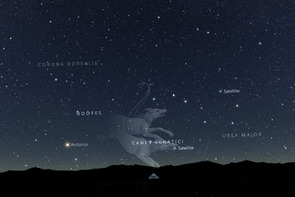 Using Night Sky Tours, you view your night sky as it appears throughout the year. The program prints star charts that you can easily transport for quick studies and outdoor stargazing. Bundled with a 104-minute DVD, SkyTheater, and the 192-page Starry Night Companion illustrated book, Starry Night Enthusiast delivers a personal planetarium. You can view the sky from different locations, as it appeared in the past, and as it will look in the future. By selecting different rates of time flow, you can watch the sky go through daily, seasonal, and even millennial changes. For example, if you set the viewing rate to one day per time step, the planets appear to sweep across the constellations of the zodiac. SkyGuide’s Quick Find feature lets you travel through interstellar space while Starry Night displays the galaxies in 3-D. Cruising through the Virgo Cluster, which is densely packed with constellations, is especially spectacular. The program’s Spaceship mode allows you to cruise, at speeds of up to 50 million light-years per second, to any of 28,000 distant galaxies, but it’s difficult to master, as are Starry Night’s other manual navigational controls. And the program’s display options, which control the brightness of stars, rendering of planetary surface detail, and display of planets’ and moons’ orbital paths, are complicated by an unfriendly interface that makes finding a specific setting difficult. Imaginova released version 5.0 prematurely; a number of annoying bugs mar the program. It installs in your Mac OS X root folder rather than in the Applications folder, for example, and you have to eject the installation discs manually. Cursor behavior is erratic: the cursor’s shape (arrow, hand, resizing tool, and so on) doesn’t change correspondingly as the mouse moves over different types of objects in the user interface. On-screen text is sometimes cut off and therefore unreadable. And the program occasionally leaves you stuck staring into a vast star field—doing a 180-degree turn to fix the point of view is not always easy to manage. Version 5.0.1, which Imaginova says will address these problems, should be available by the time you read this. The Pro version of Starry Night 5.0 offers extensive astronomical databases and can automatically aim digitally controlled physical telescopes at selected viewing targets such as planets and moons. While serious astronomy buffs may find that advanced features such as these are useful, Starry Night Enthusiast will satisfy casual stargazers. Both Starry Night versions, Enthusiast and Pro, offer a wealth of astronomical information, including the lengthy bundled DVD and illustrated book. Once the bugs are fixed, this appealing program will be the perfect ticket to a voyage into any night sky. Access the Planets: Starry Night shows an image of Jupiter as its moon, Io, casts a shadow on the planet’s surface.